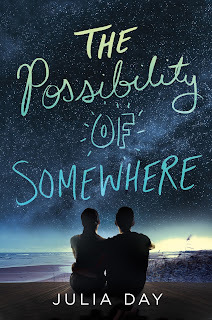 In her contemporary YA debut, THE POSSIBILITY OF SOMEWHERE (St. Martin’s Griffin; September 6, 2016), Julia Day uses Jane Austen’s Pride and Prejudice to frame a sweet story about two overachieving high school students who want more than their small hometown has to offer. Ash and Eden are fighting their parents’ expectations, their school social status, and each other for the valedictorian spot, but when they are forced to work on a class project together –something seems to change. All Eden's ever wanted was a way out. Her perfect GPA should be enough to guarantee her a free ride to college– and an exit from her trailer-park existence for good. The last thing she needs is a bitter rivalry with Ash, who wants a prized scholarship for his own selfish reasons. Or so she thinks... When Eden ends up working with Ash on a class project, she discovers that the two have more in common than either of them could have imagined. They’re both in pursuit of a dream – one that feels within reach thanks to their new connection. But what does the future hold for two passionate souls from totally different worlds? 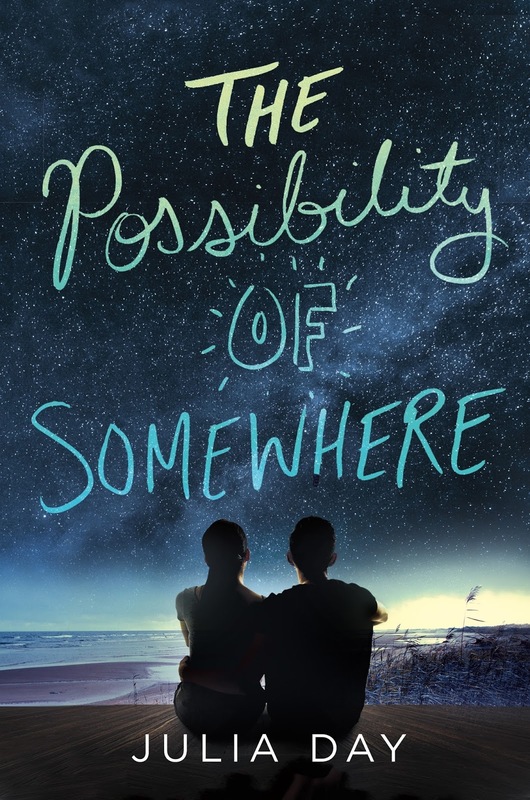 With a cast of characters that feel very real, from an autistic four-year-old boy Eden babysits to the new girl in school who shakes things up, THE POSSIBLITY OF SOMEWHERE is a look back into the awkward period in high school when the future is in transit. A touching back to school read about first relationships, Day’s contemporary YA debut will have you falling in love. from my dad) over jeans that had only been owned by me. I fin- ished off with my best sneakers, freshly bleached. I crossed to the table and stared down at the plate of food wait- ing there. The bus dropped us off fifteen minutes early, something that would never happen again. I went straight to my first-period class. AP English Lit with my favorite teacher. “Morning, Ms. Barrie,” I said. I slipped into a desk in the back row and watched as my class- mates trickled in. seventh grade, picking each course to maximize my GPA. Every- thing had gone according to plan until three weeks ago, when I’d switched to a different math class and elective. The decision had seemed bold at the time. Now, it felt crazy. After English, I dropped by my locker and arrived late for second period. With nervous anticipation, I smiled at my statis- tics teacher and turned toward the back. “Wait, Eden. Sit there.” Mrs. Menzies gestured at an empty seat on the front row. I paused, looking from the desk to her. She eyed me steadily, a challenge in her expression. Did she expect me to argue with her? I certainly wanted to. Swallowing hard, I took my seat. I tuned out what she said, too annoyed to listen to whatever welcoming remarks she had for us. They would be on her sylla- bus anyway. I was consumed with shrugging off how much it bothered me to sit in the front with a dozen pairs of eyes behind me. Were they watching me? Probably not, but I didn’t like that it was a possibility. Even deep breaths betrayed me, because they filled my head with the soapy-clean, spicy-cologne scent of Ash Gupta. Why did Mrs. Menzies have me sitting next to him? I glanced at her. Group projects already? Was that why we had assigned seats? The sounds of dragging chairs and laughing voices filled the room. I checked around. Was I the only one who didn’t know what to do? I dragged my desk into the circle beside him. There were five of us in the group. Upala and Dev were Ash’s friends. A built-in alliance. They would vote as a bloc even if I could get the last guy on my side. The next few minutes blurred into the rhythms of a project team pretending to become cohesive. I didn’t join in, listening instead to Ash control the discussion and watching as Mrs. Men- zies went from group to group, dropping off a large bag of M&Ms, several paper bowls, and the project sheet. When she finally arrived at our circle, she described what she wanted and then gave me a hard stare. Silence greeted my speech. I glanced at him. His gaze held mine for a second before he frowned at his notebook, picked up a pen, and began drawing tiny perfect squares, one after the other. I looked at the rest of the team. Upala and Dev glared at me but didn’t disagree with my suggestion. Probably hated that it had come from me, though.